Claim to fame: On Aug. 23, 1989, Davidson ejected Youppi!, the Montreal Expos mascot, after repeated complaints from Dodgers manager Tommy Lasorda. It seems Youppi! had been dancing on top of the Dodgers dugout roof while dressed in a nightgown. Davidson is the game's angry old man. His career ejection rate of 4.4 percent is twice the major league norm. ... When it comes to plate judgment, Davidson isn't at all controversial. Davidson has a history of grandstanding to draw attention to himself, whether it be his incessant balk calls, his meddling into other umpires' calls, his rabbit ears, thin skin, and quick ejections. Baseball players, managers and coaches have come to expect Davidson to hot-dog his way through games. I don't even know why I'm mentioning specific episodes; if I listed every call that Davidson got wrong I'd be typing for the next 48 hours at least. He's a disgrace to the game and has been for many, many years. Baseball people laugh at him. But here's what worse: that MLB continues to employ this clown. Davidson is living proof of the low, almost non-existent, standards for MLB umpiring in today's game. 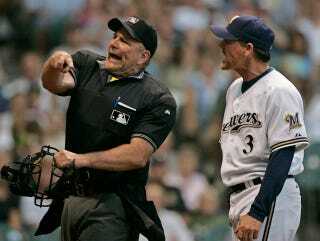 True fact: On September 7, 2010, before Trevor Hoffman recorded his 600th career save, Davidson pulled off the holy trifecta of ejections: the home team (Brewers outfielder Chris Dickerson), the road team (Cardinals pitching coach Dave Duncan), and a drunk fan. I fucked it up. 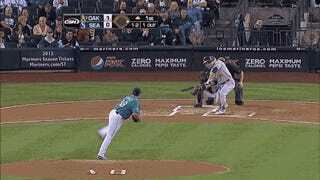 I'm the one who thought it was a damn foul ball. I saw it on the replay. I'm the one who fucked it up so you can put that in your paper. ... Bolts and nuts, I fucked up. You've just got to move on. No one feels worse about it than I do.